scud » March 19th, 2017, 7:19 am wrote: Over on the Nuke Hoax thread, Simon recently posted this little jewel of a 1950‘s film by General Electric. HAHAHA, well, sorry for being a little sarcastic dear CF members, but that Uranium 2 + (3+8) i.e. 2 X 11 = 22 / 2 = 11 (or whatever our spooky masonic men really want us to read their fantastic masonic literature) Giza pyramid analogy is priceless. This is so obvious to me, I mean, it's as if I could almost see their cynical mind patterns coming off their tricky brains. PYRAMIDS !! Of course, what else ! I chanced upon something last night that I think should be of interest. I wrote in the opener.. Anyone heard of 33 Thomas street NYC? I hadn’t, yet from the appearance of this somewhat forbidding looking structure located at this address you’d think it’d be reasonably well known. 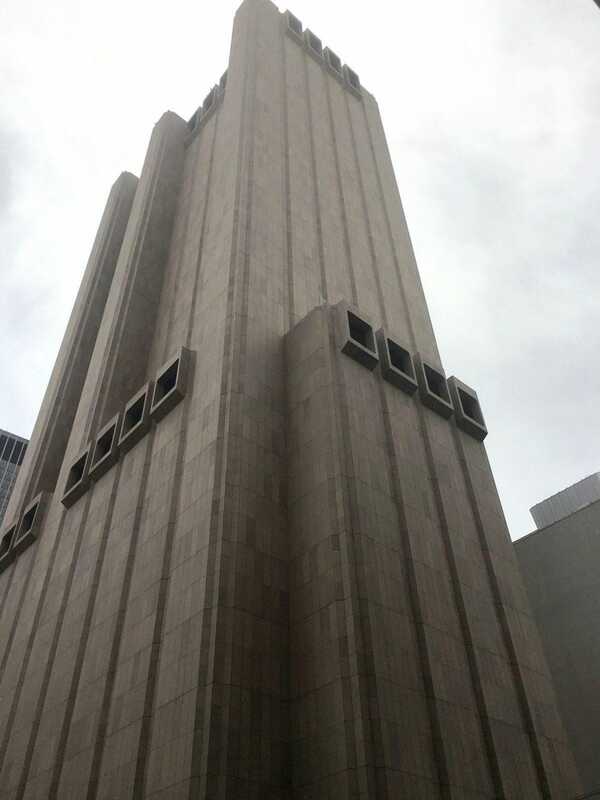 Formally the ‘AT&T building’ but now apparently, at least part occupied by the NSA..
More info’ on the structure can be found here..
From a cursory ‘images’ search I found this short article.. https://theintercept.com/2016/11/19/nsa ... os-inside/ which I think is worth a read. So, a Mr. Stanley Greenberg sets out to gather a few pics for a book entitled ‘Invisible New York’ and was privileged enough to be granted access to ‘Two or three floors’ of ‘Longlines’ (the buildings nick name). Odd that the pictures weren’t published because I find this particular one to be very interesting..
Due to the fact that there are no windows, I think it’s safe to say, that as with ‘Tottenham substation’ 33 Thomas street is not primarily designed as a place for work but rather as a very large storage facility, that just so happens to have (from the wiki link) unusually strong floors (I suppose because ‘telephone switching gear’ is real weighty stuff). Remember, the grid doesn’t have any capacitance to speak of because it doesn’t need any. Supply and demand are all worked out at the power stations themselves, burning more / less coal or fissioning more / less Plutonium (or whatever) to raise / lower the pressure of steam to keep their turbines spinning at a constant rate, perfectly matching the electromagnetic load at any given time. By the way, a few months ago I made good on my own promise to visit Drax power station. I didn’t write up about the trip because it just wasn’t particularly interesting and there was really nothing that struck me as glaring evidence that it was all just a smoldering prop and not producing anything of actual use. For sure, we were tightly herded...no going off the beaten track. We were supplied with ear protection for the turbine hall but really non was needed. Unlike the BBC doc that claimed ‘a fine coating of coal dust everywhere’ the place was clean as a whistle (though pretty dilapidated). I suppose the strangest thing (that everyone in our small tour group picked up on) was the near total absence of personnel. I think I counted no more than ten, the majority of which seemed to be sub contractors of one sort or another, just sitting around or performing some non-essential looking task. Our guide said that total staff numbered about 1,000 full time with a further 500 dedicated ‘subbies’. Dunno, maybe everyone was just having a day off from supplying 7% of the nations electricity requirements that particular day. This gentleman - Eric Dollard is interesting in terms of this and I perceive him as genuine. But I am aware this area is clouded in disinformation and organized opposition. I find sites like Electrical Universe or Thunderbolt suspicious since they like to confirm and talk about things like Nukes and NASA. It's not very good in terms of presentation but the leads to past forgotten/hidden away electrical science is interesting. I doubt for example that Nuclear Power plants do what they advertise. And Dollard talks about these spikes or build ups that can occur in high voltage power grids. Maybe Nuclear Power plants and the facilities mentioned in the previous post are giant capacitors with the purpose of dealing with this? I have no idea and just throwing this out there. I suspect how high voltage power works is something the Nutwork is keeping for themselves and that they use their usual modus operandi of manufactured conspiracies and disinformation. I think the key to this is to go back and look at what the science had to say in the late 19th and early 20th century, before it was murdered with Einstein et.al..
My hunch is that hydroelectricity is probably capable of feeding the entire world with cheap clean energy and that this is the case right now, but the Nutwork does of course not want us to figure this out. They want us to burn their oil and believe that solar and wind are viable solutions to create electricity and that Nuclear power is real. My time is limited and I've got my hands full with Tychosium right now, but I hope this thing will be busted open in the future, just like 9/11, NASA, Nukes, Terrorism, AIDS, Vaccines, Nutrition, the Heliocentric model and theoretical physics. Just to mention a few. This site has accomplished a great deal. Maybe someone with engineering background (and the needed perspective acquired from Cluesforum) will have time to look at this?